The news just keeps getting worse coming out of Nepal: the death toll has topped 4000 and the number is expected to rise in the coming days. And, from the comfort of my office, with several computer screens open, my smart phone next to the keyboard, and Top 40 playing on the radio, it’s hard understand the devastation so far away. Yet, I have two friends with a daughter (teaching) and a sister (hiking) in Kathmandu that are trying to stay safe in the wake of the aftershocks. Nepal has been a destination for international surrogacy, especially for those that are unable do so in their own country due to laws or the fact that an surrogacy costs only around $6000 there. Although a microcosm in the huge tragedy that is occurring there, there are now, unfortunately, reports coming out of the country are that there are a number of parents via surrogacy and their newborn babies that are in Kathmandu seeking evacuation. 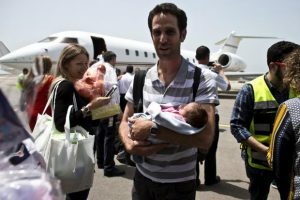 Families of 26 babies born to Nepalese women on behalf of Israeli parents appealed to Jerusalem for assistance, with the first three families arriving in Israel yesterday night. Approximately 100 Nepalese are pregnant with Israel babies. (https://www.newsweek.com/israel-begins-evacuating-surrogate-families-nepal-325491). It is unclear what will happen with these cases. I do have to wonder about the notion of pursuing surrogacy in a country with a per capita income of $1350, where so many live in poverty, there is little infrastructure, and where buildings have not been designed to withstand the magnitude of tremor that felled them like a house of cards. Is the draw because of the low cost os surrogacy (about $6000), or the fact that many countries have laws against surrogacy and the families must seek help elsewhere? Regardless, this is a tragedy of epic proportion. There is no intent to take away to what’s unfolding on a grand scale in Nepal. Our thoughts and prayers are with the people there.